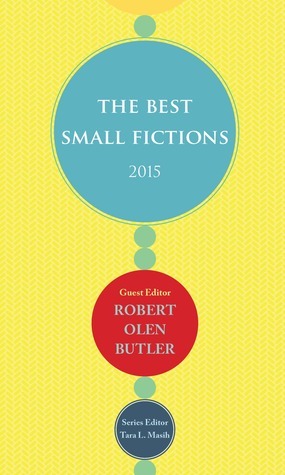 The Best Small Fictions 2015 is a collection of very short fiction originally published by a variety of publications. I was asked if I would review this book by the series editor Tara L. Masih several weeks ago. I accepted because I like it when I am asked to review something that isn’t a vampire apocalypse romance novel. I was not entirely sure what small fiction was about but was told there was prose poetry included. That was good enough for me. I will say I was very surprised with this collection. I usually do not care for short stories because I feel dropped into the middle of a story and pulled out before it’s over or before I completely understand what is going on. Small fiction, however, is the matchbox of fiction; no story is more than a few short pages. There is also the feeling of completeness in these shorter stories that are missing from traditional short stories. It is not Cliff Note or the Readers Digest version of a story either. There is a fullness that usually requires many more words. Rocks grind their granite teeth over geologic eons, holding their grudges close. You cannot win against them. Your little flame of curiosity, infinitesimal by comparison, will gutter before it illuminates even the shallowest depths of that darkness. You will fall. There is a rhythm and a taunting voice that leaps from the pages and expands the words into something more than simple prose. It reads like a dark fairy tale with enough detail to fill a dream. Some stories capture real-life events and the little embarrassments that join them. Stuart Dybek’s “Brisket” is such a story. The trappings of everyday life capture us when we are distracted. “Brisket” is a great story with a moral that even vegetarians like myself can enjoy. Adding to the real life theme, Naomi Telushkin and Dan Gilmore write realistic, timely tales of identity. Not everything is light. Emma Bolden’s “Before She was a Memory” touched a very real and dark place in my life. Catherine Moore’s “Not About Liz” seems innocent but has a dark and creepy undertone. These works have all been published in various places and collected as a “best of volume” much like David Lehman does with the yearly Best of American Poetry series. The sources range from Twitter, to 100 Word Story, to Black Lawrence Press, and a wide variety of other publications. Also included with this collection is an interview Phong Nguyen of Pleiades and an interview with Michael Martone who has two stories in this collection. This is truly a well-selected collection and has given me a new appreciation for small fiction. The Best Small Fictions 2015 will make you a believer in small fiction as literature. I’ve read so many reviews on Goodreads and elsewhere of story collections or anthologies by reviewers who begin by saying they don’t like short fiction and then go on to pan the books based on that bias alone! This review is refreshingly open-minded and thoughtful. Thank you. I am a huge fan of short stories, because of the jumping in and out of a scene! I especially like reading short fiction by authors like Hemingway and Fitzgerald because I like to see how their styles developed. I had never heard of small fiction. I think this is something I would really like. Great review! Autumn 2015 contributor Tara L. Masih is series editor for The Best Small Fictions 2015. Here’s a review from the Evilcyclist’s blog. Hey I want to say thanks for being such a loyal follower. if there was an award for that I would hand it to you hands down!! Ty so much for never leaving me down. “Not a vampire romance novel”, a point well made.